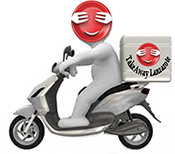 Food Delivery Service from Best Restaurants - Lanzarote. Hamburgers There are 9 products to choose from. Takeaway Lanzarote - Restaurants Playa Blanca Burger “Mexico” Best Burger Playa Blanca - Delicious Homemade Burgers Takeaways Playa Blanca Lanzarote - Late Night Burger Delivery Playa Blanca - Lanzarote Burger with lettuce, tomato, onion, cheese, avocado, guacamole.